Wonderful Wagon: Chicken Curry My Kids Will Actually Eat! Chicken Curry My Kids Will Actually Eat! I can’t believe it. I have stumbled upon a chicken curry recipe my boys actually ate. One of them even asked for more. I was so happy I decided to ignore my complete oversight in defrosting only four chicken breasts and not six as the recipe called for. Because in another tippin flippical moment I fully expected them to turn their noses up at it like they usually do. I didn’t want to be looking at a pan of chicken curry for two days and it’s not the type of dish that would freeze well. So of course, they all decided this was the nicest thing they had ever tasted (except for chocolate, soft mints, ice cream and pancakes) and I ended up having one bite sized piece of chicken coz I gave the rest to my boys. I blame the Kiddi Pharmaton. More about that later. Here is the recipe really quickly. 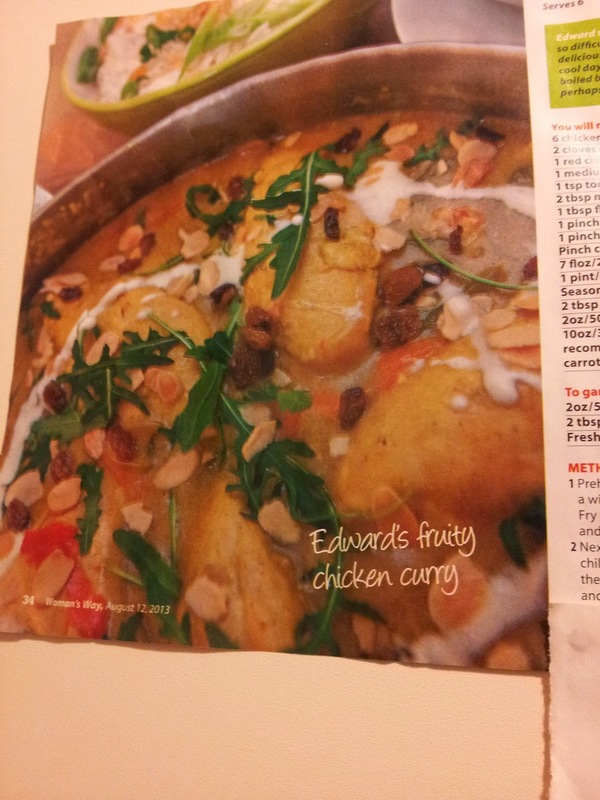 It’s called Edwards Fruity chicken curry and I got it from a Woman’s Way magazine a few years ago. A squirt of ginger from a tube because I didn’t have the real stuff. You can add 2 tbspn mango chutney. I forgot about this. 50g sultanas. Forgot these too. And all the veg you want such as peppers, mushrooms, carrots, courgettes etc. I just used a red pepper as my kids would pop into a million pieces if I suggested vegetables. A garnish suggestion is 50g flaked toasted almonds, 2 tbspn natural yogurt and freshly chopped parsley or coriander. Again I forgot this part/didn’t have them. I improvised towards the end and added a hefty teaspoon of Thai red curry paste as I felt it missed something. I did it all in a casserole pot on the hob but the recipe suggested 180 degrees in an oven at 50 minutes. Then I spooned in the tomato puree and stirred to ensure it coated the meat. Followed closely by the curry powder, flour, turmeric, cumin and ginger. I found this mixture was very dry and it began to stick to the pan so I added a few splashes of stock to make a thick paste. This worked fine. I added the rest of the stock followed by the coconut milk and stirred really well. I needed to add a little more flour as the curry was very watery but this brought it all together very nicely. Basmati rice was also suggested but I made do with a couple of boil in the bags. With recipes like this I find you can add your own touches along the way. Nothing is set in stone. Reading the recipe again as I type it out, I decided the mango chutney and natural yogurt would have made a delicious addition. You could also add a nan bread. And wine. Wine would be gorgeous with this. Either before, during or afterwards. Or now. Wine would be nice now.